Alicia Thomas is the founder and CEO of Dibs, a B2B digital platform that gives studios quick and easy access to real-time pricing for the boutique fitness classes their clients want. A former developer and director of data strategy at Citigroup, Thomas chose to start a company in the fitness industry because she knew she would have a competitive advantage. BroadMic host, Erica Duignan, and Thomas discuss what she’s learned about focus and “getting it done” when it comes to fundraising, her advice for female founders, and her perspective as a woman of color in tech. Alicia Thomas is Founder and CEO of Dibs. She's a former developer and was director of data strategy with Citigroup. Alicia: I wanna buy an $8 million house, right, and maybe a white guy also wants to buy an $8 million house, and let's say that his grandfather dies and leaves him $2 million. So he's $2 million ahead of me, but it's challenging for everyone. Female: I am an entrepreneur. Female: Be inspired. We are incredibly powerful. Female: Color outside the lines. Female: The narrative needs to change. We can fix this. We can change this. I know we can. Female: Think like a broad. Interviewer: Today I'm in the studio with Alicia Thomas, CEO and founder of Dibs, a digital platform that gives studios quick and easy access to real-time pricing for the boutique fitness classes their clients want. She's a former developer and was director of data strategy with Citi Group. Alicia will be discussing what she's learned while raising her seed funding, and she'll be providing her advice for female founders as well as her perspective as a woman of color, founder in tech. So welcome, Alicia. Alicia: Thank you, Erika [SP]. Great to see you. Erika: It's great to see you again. So, everyone knows Alicia and I actually go way back. We were actually in college together at UCLA. Alicia: First roommates for the summer. Awesome. Erika: Very first roommates in college, and both in the engineering program at UCLA. So, obviously you're not only a founder, but you're also an engineer. Can you tell us a little bit about what your experience has been like, particularly as a woman of color in engineering? Alicia: Yes. From the perspective of the founder? Erika: Yes, absolutely. Well, both. I mean, you can start off with you weren't always a founder. 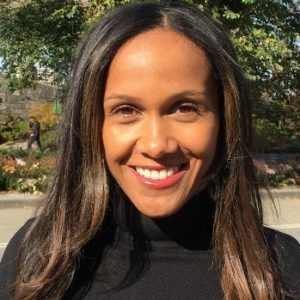 Alicia: So I would say that my perspective on the engineering side and being one of the only women, one of the very, very few people of color, people, period, of color, has been, prior to starting Dibs and starting my former company, it wasn't necessarily a challenge for me because it was something I had been used to my entire life. I grew up in San Francisco. I was very used to being a minority in most situations. So as a working professional, it wasn't something that was particularly difficult because it was really what I was used to. I think that once we get into the founder world of that and fundraising and it was more difficult than I expected, it was literally the first time that I felt like, "Oh, I'm a woman. Oh, I'm black." Whereas a lot of times it's not something that you're thinking about on a day-to-day basis. And so when we're thinking about fundraising and we're thinking about starting a company and I remember people would say, "You don't have a technical co-founder," and I'd be like, "Hi." Erika: I am a technical co-founder. Alicia: It's not to say that...I was developer for 10 years. Then I went to business school, and so there's been some time that I had been away from development. But at the same time when you're talking about logical structure and the understanding of those things, like syntax changes, but logical structure doesn't really, the way that you're thinking about these problems. And so it was actually a thing that when you think about how does it affect women, and they say, "Oh, you don't have a technical co-founder." Or I've had people say to me, I'd say, "Oh, well, I'm gonna build this site or do something like that," and they're like, "Well, who's gonna build it?" "Well, I'm gonna build it." And they'd laugh. Like, "Ha ha ha ha." And it's just like, "Well, I understand that I might not have the same current experience that you do, but let's not discount the information that I do have. I have math major, econ, minor computer science." You know, it's like, "That's not anything that's completely un-technical, and again, developer for 10 years." Erika: It's still an $8 million house. Alicia: Yeah. It's still an $8 million house. So he might be ahead of me, but it's challenging for everyone. And so I choose, I try to really focus on blocking out the noise and just focusing on how do I get it done for my company and while it's totally relevant, of course it is, because at the end of the day, most of the investors that you're pitching to are men and most of them are white. That's just the reality. I think that over the course of the fall, talking to, I don't know, hundred-something people, during that time, I spoke with two women. You were one of them. And that's kind of crazy. When you really start to understand this world of fundraising and investing and from the challenge of a woman, the reason that I chose to focus on the fitness industry was because I felt that that was a competitive advantage that I had as a woman. Erika: Absolutely. Well, let's talk a little bit about there. So one of the things that I think is so interesting about what you just said is that as somebody who I've never really spent any time working really on the technical side but as somebody who's worked for a long time with people who are trying to start tech companies to realize that, as a director of Data Strategy at Citi Group and you walk in the room, people are gonna assume that you know what you're talking about versus absolutely as a woman and a founder of a company that's in tech space and you walk into a VC meeting. There's not always going to be that assumption that, "Yes, she's the technical co-founder. She knows what she's doing." So it's a very interesting new challenge that I'm sure you weren't used to dealing with. The other thing that you mentioned that's really interesting is this idea of not only do you have to talk to 100 investors and only bump into maybe one or two women, but just how normal this is that most people do have to talk at least a 100 investors before they find the right fit. So can you tell us a little bit about your experience and what things you think really helped you in your quest to find the investors that were the right fit? Erika: They get rejected all the time. Alicia: All the time, and they're like, "No big deal. Moving onto the next one." And so for me, especially focusing on fitness, what I heard a lot was, "Oh, well..." You think about companies like Mind Body, for example, they have a $600 million market cap, and they're like, "Oh, that's nothing. That's baby. Unless it's a $5 billion business opportunity, then we're not interested." Erika: And that's part of the trick with the VC model that everyone's sort of out unicorn hunting while there are lots of amazing businesses that could be great. Alicia: Yeah, where there's untapped value. And so for me, the first challenge was finding people who understood and connected with the fitness industry, which was really going through and is still going through a time of massive change. So it makes it really interesting, but most of the people that are consumers of the boutique fitness are women. So there's a big disconnect between the investors and the people who actually do it. And so that was the first piece for me that was challenging. Once we...our big break, it's, I don't know if it's a break, but the thing that happened with our seed round that started things off was we were in San Francisco. We were having meetings as part of Dreamit, the accelerator that we were in, that you also were working with. Alicia: It helped a lot, and it set off the seed round, which...and it was still really difficult. Erika: But now you've pointed out one of the number one things that you want investors to have to get their money, which is what we call FOMO. They need to have fear of missing out before they'll actually write your checks. So you had that on your side. Alicia: Yeah. So that was actually the most humble thing for us. They actually understood the space because they had looked at it before. But from then it was still difficult. It was still painful, but we got through it, and I feel like it's one of those things that is necessary. As a founder, you're going to come across so many things that are painful and difficult that you have to get through. It's like, to me I look at it as a first test. Erika: And what do you think were some of the things that you learned during the process of trying to raise money, that you would go back and tell yourself at the beginning, particularly around pitching versus building relationships? Alicia: I will say that some of the advice that we got from investors, even if they turned this down, some of that advice has been instrumental in building our business. So what I would say to everyone who's looking at raising money is don't look at...don't go into a meeting with the expectation of, "I wanna get a check." Go into the meeting with the expectation of, "I'm gonna have coffee with a really interesting person, and I'm gonna learn something about them and maybe they'll learn something about me." And that's it. That should be the expectation because whether you get a check or not, I can't...even the checks that we've received, there isn't necessarily a direct correlation between, "Oh, this person, I knew that they were gonna do it and this person, I knew they weren't." It really is...someone was feeling great that day, and someone else might take eight months to write a check, where someone else meets you for literally 30 minutes and you have...they've wired the money the next day. So everyone has a different thesis. Everyone has a different way that they look at it. So as a founder, you should be looking at it as my everything is a step towards that race. You're giving more people the opportunity to get to know you. You're giving more people...you're getting more advice. You're getting more feedback. Your pitch is getting better because you're talking about more and you hear it, you hear yourself say something for the first time, and you're like, "That sounded terrible. I never..."
Erika: Or, "That sounded great." Alicia: Yeah, but it gets better as you...the more and more that you say it and it also makes you more comfortable having investor conversations, which is about confidence, like all of this is truly about confidence and having enough faith in what you're doing that you really, really believe in it, and that has to come from your gut literally. Erika: Yeah, so that is really good advice. I'd love to start at the beginning though and hear in your own words what inspired you to start Dibs. I know that you were working on something else at first, and then you went through some challenges to get here. So tell us a little bit about what prompted you to get into the world of entrepreneurship and how was Dibs born? Alicia: So that, it was so...I felt it so strongly that I needed to have a company, and it wasn't for anything else but for this I wanted control, and so I'd had...I'd worked for a very long time in Los Angeles and in New York, San Francisco, and I hated feeling like I'm going to be working hard. I'm also a very, very hard worker. I will pull five all-nighters a week if I need to. I'm just like...especially from the programming. I just had that sort of...it's hard to turn it off. And so I was going through this process, and I'm looking at where do I want to be in 10 years in my life, and I saw my road, which was, okay, so maybe you're getting promotions. Maybe you're doing that, but my upside was never me having control. And so I felt like I know I'm going to be working, but if I'm going on a business trip, I want to decide when I'm going on that business trip. I want to decide who it's important that I should meet, who it's not important that I should meet. And at the time, I had no control over that. I had, "You're flying to wherever on Tuesday," and like, "Well, okay." And all of a sudden I'm sitting in a meeting. No one wants to be in that meeting. I truly didn't feel inspired by it. I felt like, if I'm going to be working, which I know I am, I want to be doing something that I believe in, that I'm making decisions about, that I have control over, that there's not someone in another room deciding, "Is Alicia going to get a promotion or not? What's her bonus going to be this year? At that time, I felt, "10 years down the line, I wanna be making those decisions," and that's literally...and especially as a woman and having children and things like that, having some sense of, "I can control this instead of my career is gonna be jeopardized if I have children," or things like that, which a lot of women face in the corporate world. We know, "Maybe sometimes I can't fly on Tuesday and stay until...and do that every single week because maybe I'd like to see my kids sometime." Erika: So this really gave you some control of your own destiny. Erika: ...as well as some purpose because you were able to choose. Most people would rather work in the fitness industry than for a big, behemoth conglomerate bank. Can you tell us a little bit about what inspired you to start the first company, right, which was KiwiSweat, and how did that evolve into the current company, which is a much more technical approach to the problem, which is Dibs. Alicia: And so it was really...so KiwiSweat was the fastest way for me to do something, and it's almost...I had a former business partner, and we were very naïve in thinking it was...there was a lot going on in the fitness industry. "Let's do something in it." And we were very naïve in terms of how much work...so Kiwi Sweat started out as a puppet fitness company, and we said, "We're gonna do all these different events in all these different locations." Our first location was Chelsea Market, where we had a spin studio for two weeks. Because we didn't know any better to be intimidated, we went directly to the top of who's the best spin instructor and went to this woman, and she's wonderful, Lacey Stone. We're still in touch. She happened to have just left Equinox at the same time, and we said, "We're doing this thing." She's like, "You know what? Why not?" And we're like, "Great." And so we did this. We set up a spin studio. We drove the trucks ourselves. We moved the spin bikes ourselves. The manual labor process of it was awful. Erika: It's not all glamorous. Alicia: No. And I think it was one of those things where, if we had realized how hard it was going to be, thank God we didn't because we never would have done it. There was so much that we were working at that...it was just the two of us. We'd get there around 5:30 AM, and leave around 9:30, 10:00, clean off the bikes, and when I say we literally moved the bikes and drove the U-Haul truck, we literally did that. I had a car with the hugest U-Haul truck that you can drive without a commercial license. Really crazy stuff. So, over the time, it was about four years, the company evolved into becoming more and more...thinking about how can we...our problem was our business model wasn't really scalable, and I set out to do something that was really go be...I wanted it to be able to be a really large business. So I started to see opportunities around pricing, around this challenge that we kept talking to studio owners, and they're saying...we were like, "Maybe we can share and use some space." And they're like, "No, we can't do that, but here's this problem that we're having over here." And I literally looked and I said, "Whoa. Okay, so we're talking about data. We're talking about development. We're talking about fitness." Those are literally the worlds that I had spent time in, and it was like this perfect culmination of...I have the skill set to be able to do this, and so that's where it came from. Erika: So that is really cool. I mean, and we'd love to, learn more, too, about just your experience with parting ways with your founder. So it absolutely was a perfect storm for you, this new opportunity but not so much for her. And we know that that's a big challenge that people face. When is the right time to stay together versus part ways, and what are some of the challenges? I'd love to hear some of the challenges that you faced in pivoting the business to it, newer, more scalable, lucrative market opportunity, and what that meant for your relationship with the original co-founder. Alicia: Yeah, sure. So my original co-founder and I obviously had worked together for four years, had become really, really good friends, and that was, as I started to see this opportunity for an idea that was a truly technical company, and we also got some feedback from investors and things like that, that the two of us together running the new way that we were looking at the new opportunity of thinking about Dibs, and it wasn't even called Dibs. We had no name obviously at that point. So it was thinking about our skill sets and what we were bringing to the table. She wasn't a technical person. That's not to say anything bad or there are people who have technical skills or there are people who don't, and what we were really thinking about is...or what I was really thinking about is who's best for this company, and it's the worst thing in the world to have to separate from a founder, who actually is not someone that you're necessarily fighting with, who actually you have the most respect for and who, at some point, over the time of you guys working together, has become a friend. And so that's always difficult for any founders because you're looking at it...you don't wanna hurt anyone, but you also are thinking about what is literally best for the business, and from that moment, I have changed my focus really. Every decision that I make is about what is best for this business. I say this all the time to my team. We have eight people. There's no one person that is above what's best for Dibs, and everyone should know that because you can't be. If we're not working together to push this company forward and we're putting my needs before the needs of the team, it's not gonna be the right thing. So it's very difficult. So many people go through it, and it's like a divorce. Erika: What would be your advice about some things that you wish you'd known maybe in advance to help the process move more smoothly, and what were some of the challenges that you felt you weren't prepared for and you wish somebody had told you about in that whole disentanglement process? Alicia: I don't know that there's more that we could have. I think that I was, prior to Dibs or prior to any separations, I was very focused on, "We're all friends. Yay! Isn't this fun?" And really when you get down to it, it's, of course, like we want to build companies where we have fun together and part of when we were talking about what was the inspiration of starting a company, I was thinking, "I wanna start a company that I wanna work at." And so, of course, you want it to be fun. You want to like your co-workers and the people that are working alongside of you. But what we really realized or what I realized is, well, there's no company if you don't have the right people that are helping to bridge the gaps that you have in your own skill set. So one of my strengths is not communication or I'm not a wordsmith, and so I have other people on our team. I'll say, "This is what we're looking to say. Why don't you edit and turn it into the Dibs voice?" And so it's really about saying, "This is my skill set. This is where I'm really strong. Let me find other people who are really strong in other areas." And so that's the thing I would have been more conscious of as I was thinking about even the first company or Dibs. But at the same time, it is such a learning process and I don't think that...I think that some of these things, you just have to go through. You just have to. Alicia: Since we were 17, two years ago. Erika: Yes. Just a couple of years ago. So now we just wanna move on to what we call our Pay It Forward section, and we're gonna devote just about a minute to making our listeners a little bit smarter with some of the knowledge that I know you're ready to drop on them. So first surprise question of the day. What are your primary sources of information? So blogs, ads, TV shows, podcasts that you might listen to? Erika: "I don't have time to read any of it." Alicia: I don't, to be perfectly honest. There was podcast called Startup, was life-changing for me. Erika: Any favorite book that you're reading right now or you've read in the last six months? Alicia: So I just ordered the Elon Musk book, but I haven't started reading it yet. It's supposed to arrive today. Erika: So you have to let know how it is. All right, very cool. And do you have any rituals or daily habits that you swear by? Meditation, brushing your teeth, I don't know. Erika: That's why you're in such a good shape. I love it. Alicia: It's really important to take a step away, as even if it's just 15 minutes or 20 minutes, it's so crucial to just walk away, and that's when ideas come, and you never know. Erika: Yes, absolutely. So who are three female entrepreneurs or leaders that you admire? Alicia: This is so cliché, but Oprah is a person. Erika: That's a good one. Alicia: No, but it's so cliché, but it's so true, and the reason I say that is because she's a black woman who really went after what she wanted and she didn't let people, what people said about her stop her from doing something. So if they said, "Oh, you're not pretty enough," and she's like, "Well, I'm gonna do it anyway." And I think that that is so crucial to understand and just approach from just in life in general. Actually, one of our investors, who's Arlene Hamilton [SP], and so the main thing that I really appreciate about this woman is she had no VC background. She had nothing that said, "I know exactly what I'm doing. I have all this money." She said, "You know what? This is a problem. I'm gonna start solving it the best way that I know how." Erika: Yeah, absolutely. What is the best advice that you've ever received? Alicia: Just get on the road. Erika: Get on the road. Don't [inaudible 00:27:11] train track. Alicia: Literally, just start. Period. Just start. Alicia: Don't focus on, "Oh my God. I can't." Erika: What words of advice would you give to listeners about taking risks and closing the confidence gap? Alicia: Taking risk...and I would say that confidence is a thing that I...and I'll be super honest. I am way more confident now than I was when I started a year ago on this company, and I have found that confidence is truly the difference between a successful meeting and an unsuccessful meeting, and it's, like I said, it's one of those things that you cannot fake. And so one thing that I would say to women, whatever it is, men have this skill, and it's amazing to just fake it and be like, "I'm just gonna argue more confidently than you do." And so what I would say to women is get the confidence. Get the knowledge. We've never been in such a time where you can teach yourself stuff from Google or YouTube or whatever it is. Erika: So the last question that I wanna ask you, and this is a little bit more open-ended is what does "think broad" mean to you? Alicia: To me, it's really about what we were saying before, which is don't tell me why you can't. Literally, tell me 10 reasons why you can. Erika: That's amazing. Well, you took the first step, and you've taken a million steps after that, and you're killing it. So congratulations, and I just wanna thank Alicia Thomas so much for joining us today, CEO and founder of Dibs. We're really blessed to have her here in the studio. So thank you, Alicia. Alicia: Thank you for having me. Recording: Thank you for listening to BroadMic. Find us on Facebook, where you can join the community and participate in the conversation around today's episode. You can also let us know what you think about the show or suggest future guests and topics. We want your feedback. BroadMic is produced by Christy Mirabal with editing by John Marshall Media. Our executive producer is Sara Weinheimer. Think broad.